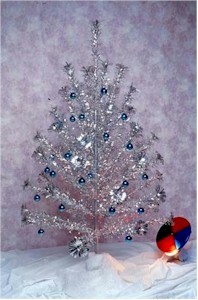 I have what is probably the current version of an aluminum tree. It's a "tinsel" tree, but the effect is very similar. No color wheel, but it's a pre-lit tree with multi-colored lights. I love it. The silver tinsel branches reflect the lights so much that I don't even put ornaments on it. It has such a lovely glow in the evenings. Ahh. My grandmother had one of these complete with the rotating colors light! We thought she was so rich to have it! I guess they make sense, in areas of the country that don't have live pine trees. Also from an ecological standpoint -- cutting down beautiful trees in order to display them for a month and then discard/burn them? Who would suggest such a practice today if it weren't already an accepted norm? This is a beautiful aluminium tree. I would love to buy a similar one for my house this christmas. My sister and I grew up with one of these on a rotating stand that played "Jingle Bells," and "Silent Night" continuously, along with a 4 color rotating wheel. We used to lay underneath and watch it change colors. . .
And people thought real trees were a fire hazard ! I still have one and the rotator lamp, as well. And it's in immaculate condition. Too bad, I'm not. Had a 4' aluminum tree in Hawaii in 1959. It looked beautiful with colored lights, never knew it was a shock hazard at the time! My Grandma had one of these too. My grandmother had one of them!! !